Map showing the location of RAF Kimbolton within Cambridgeshire. The airfield was originally built in 1941 for RAF Bomber Command, then expanded to Class A airfield standards for use by American heavy bombers during 1942. Kimbolton was assigned to the United States Army Air Forces (USAAF) Eighth Air Force. It was given the designation USAAF Station 117. The airfield was opened in 1942 and was first used by the USAAF Eighth Air Force 91st Bombardment Group (Heavy), arriving from Walla Walla AAF, Washington during September. The 91st stayed at Kimbolton only a few weeks, because the runways at Kimbolton were not strong or long enough for the safe operation of Fortresses. The group transferred to RAF Bassingbourn on 14 October. The next USAAF unit to use Kimbolton was the 17th Bombardment Group (Medium), arriving in October from Barksdale AAF Louisiana. 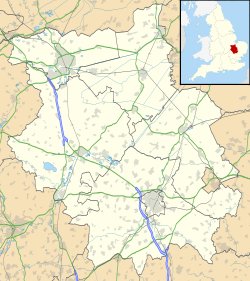 The 17th was originally intended to use RAF Bassingbourn. However, with the move of the 91st, the unit utilized Kimbolton as its shorter runways could accommodate their smaller, twin-engined medium bombers. The 17th flew the Martin B-26 Marauder medium bomber, and used Kimbolton as a transitory airfield on its way to the North African campaign. The Group departed in November for Telergma, Algeria, with its last elements leaving in early December. With the departure of the B-26s, extensions were made to the NW-SE runway to facilitate the operation of fully loaded B-17s. Boeing B-17G-45-BO Fortress AAF Ser. No. 42-97229 524th BS, "Hi Ho Silver". Douglas-Long Beach B-17G-30-DL Fortress AAF Ser. No. 42-38111 525th BS. Douglas-Long Beach B-17F-45-DL Fortress AAF Ser. No. 42-3325 524th BS, "Paddy Gremlin". Lockheed/Vega B-17G-15-VE Flying Fortress AAF Serial No. 42-97462 of the 527th Bomb Squadron after a belly landing. This aircraft was repaired and returned to combat duty. On 21 May 1943, the 379th Bombardment Group (Heavy) arrived from Sioux City AAF, Iowa. During the Battle of France, the Group bombed enemy positions to assist ground troops at St Lo during the breakthrough, 24–25 July 1944, attacked German communications and fortifications during the Battle of the Bulge, December 1944 - January 1945, and bombed bridges and viaducts in France and Germany to aid the Allied assault across the Rhine, February–March 1945. The combat record of the 379th was the most successful of all the Eighth Air Force heavy bomber groups. It held records as far as bomb tonnage dropped - 26,459 tons - more than any other unit including those operational before the 379th arrived in the UK. It also exceeded all other UK Bomb Groups in the total number of missions flown, carrying out 330 between May 1943 and 15 May 1945. Two of the 524th Squadron B-17's claimed individual fame: "Ole Gappy", completed 157 missions, probably more than any other Eighth Air Force bomber and "Swamp Fire" was the first heavy bomber to achieve 100 missions without an abort. Lt Bruce E. Mills was the pilot of that mission. According to Lt Baine A. Hawthorne, who was a pilot of A/C 42-40003, "Ol' Gappy" was the name of just the chin turret. The name was painted on the chin turret as a joke toward a crew chief with a space between his front teeth (reference the space between the two machine guns in the chin turret). The aircraft was actually named "Topper" after a then-famous movie character. The nose art was unfinished (top hat, white bow tie and white gloves) due to interruptions in painting because of the mission schedule. After some time had passed, and "Topper" kept coming home, the crews thought it would be bad luck to complete the nose art, including adding the correct name. Sadly, "Topper" was cut up and sold for scrap after the war. A better end should have been had for the B-17 with the most missions and only one abort. After V-E Day, the 379th Bomb Group was transferred to Casablanca, French Morocco, during June 1945. The unit was inactivated in Morocco during July. The 379th Bomb Wing and 524th Bomb Squadron were reactivated by Strategic Air Command and reequipped with Boeing B-47 Stratojet medium bombers at Homestead AFB, Florida, on 1 November 1955. Upon activation, the unit was bestowed the honors, history and colors of the World War II Eighth Air Force's 379th Bomb Group. In January 1961, the wing was redesignated as a heavy bombardment wing and relocated to Wurtsmith AFB, Michigan where it was equipped with Boeing B-52 Stratofortress and KC-135 Stratotanker aircraft. Throughout the Cold War, the wing played a major role in the defense of the United States. The wing meritoriously served in combat during the Vietnam War and 1990-1991 Operations Desert Shield/Operation Desert Storm flying the Boeing B-52G Stratofortress (the vertical stabilizer of the 379th's aircraft were emblazoned with the Triangle K to honor their Second World War namesake). Wurtsmith AFB, named after Major General Paul B. Wurtsmith was closed by BRAC action in 1993 and the 379th Bombardment Wing was disestablished the same year. In 2003, the 379th was reactivated in provisional status as the 379th Air Expeditionary Wing (379 AEW) of the Air Combat Command, assigned to Al Udeid Air Base, Qatar. After the Second World War, Kimbolton was closed in 1946 but maintained in a "standby" status until the early 1960s. After the Americans left the RAF used the base for basic training (square bashing). Many hundreds of conscripts did their basic training there before it was closed. With the end of military control, most of the buildings were torn down and the concrete areas removed. However, parts of the old hardstands are used for go-kart racing since 1950. The kart club's flag is the 379th "Triangle K" symbol. In one of the buildings at the kart track there is a collection of memorabilia including photographs and pieces of aircraft wreckage. Once a month, MSA Kart Race Meetings are held there. Today, the B-road which connects the village of Stow Longa to the town of Kimbolton crosses over the remains of RAF Kimbolton's main runway. The crumbling concrete is visible just past the shoulder of the road. Additionally, a public footpath crosses the main area where the control tower once stood, the foundations of which are still recognizable among the farmland. On weekends, "banger racing" was formerly held on one of the old loop hardstands. Wikimedia Commons has media related to RAF Kimbolton. This page was last edited on 6 November 2018, at 15:09 (UTC).